In Westbrook, the trend is especially evident, changing the fabric of the former mill town. WESTBROOK — Tucked in the corner of a hilly neighborhood between downtown and the Stroudwater River is a compound of duplexes – identical aside from the color of the siding and the size of the bicycles on the stoops – where hijabs are almost as popular as jeans. The scent of spices permeates the apartments, and carvings of quotes from the Quran hang on the walls in the well-kept complex, where more than 200 Arabic-speaking residents have relocated since 2010. “It’s safe. Nice people here. Nice place,” said Kosay Alwan, as two of his children, twigs in hand, chased each other on the weather-beaten grass outside their home at Westbrook Pointe. Portland has long been a place where immigrants have resettled, but in recent years a rising numbers of new Americans have made their homes in its suburbs. 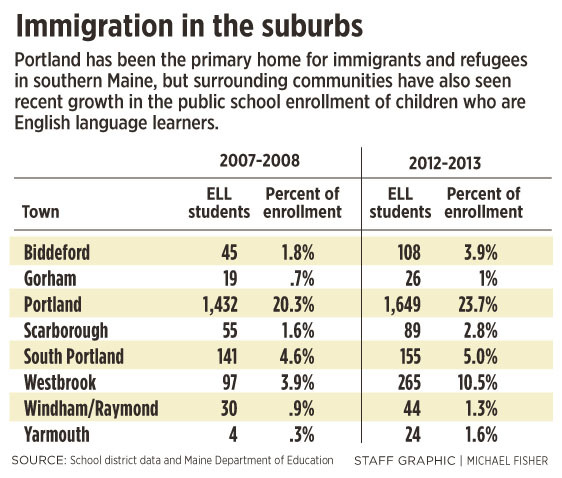 School district data show there’s been an increase in non-English-speaking students everywhere from Gorham to Cape Elizabeth, but nowhere has the trend been more apparent than Westbrook. The growing population of people from the Middle East, Africa and other parts of the world is changing the fabric of the former mill town. There’s a new ethnic market off Main Street and school menu items are marked halal to accommodate the dietary needs of the many Muslim students. Adult English classes at the community center are filling up, and nearly half of the households that applied for general assistance from the city last month identified themselves as immigrant or refugee. But the change is most evident in the schools’ English-language-learners program, which has grown almost tenfold since 2005, when it had 27 students. This year, there are 265. Meanwhile, the number of non-English-speaking students in Portland has grown more slowly, and even leveled off in the last two to three years. Many of the immigrants who moved to Westbrook came to Portland first. Many of the residents said they heard about housing opportunities in Westbrook by word of mouth, from family or a friend. Others said they ended up in the city by chance; it was the first place a subsidized apartment opened up. For many, it’s the third or fourth stop since they fled from their home country out of fear for their lives. They came by way of Burundi, Egypt, Tennessee, Texas — and from Forest Avenue and Auburn Street in Portland. Alwan said he fled to Turkey in 2008 to go “anyplace, just to leave Iraq.” Through the United Nations, he was placed in Portland, where he met an interpreter who told him about Westbrook Pointe. He likes the quiet and the quality of the schools. Those are often among the reasons immigrants — or anyone — move to the suburbs, said Audrey Singer, a senior fellow from the Brookings Institution’s Metropolitan Policy Program. For people who are new to the country, affordable housing and access to public transportation make certain towns and cities more attractive, she said. Westbrook, a city of 18,000 with a poverty level above the state average, has both. If someplace gets a good reputation within an established immigrant group in the area, Singer said, an influx of new residents can come quickly. “Once a social network forms, a lot of information is passed,” she said. 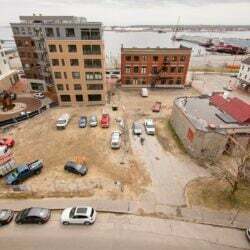 Often, Singer said, it comes down to one apartment building getting good recommendations — just what happened with the Arabic community at Westbrook Pointe and, before that, with African refugees at an Avesta Housing complex on the other side of the Presumpscot River. Called Steeple Square, the three-story homes with shutters on the windows and porches in front take up most of Walker and Webb streets. The first African family moved there in May 2009, said Mindy Woerter, spokeswoman for Avesta. Now, 25 of the 73 units are rented by families from Rwanda, Burundi, the Congo, Sudan, Angola and Togo, she said. Francine Nkurunziza’s family, originally from the Congo, moved in two years ago from an apartment on Park Avenue in Portland. “This is nicer than the other one,” she said, sitting in her kitchen earlier this month while home on spring break from the University of Maine. Her parents like that they can walk from their home to Tigris Market, a store on Bridge Street that was opened by an Iraqi immigrant in 2011 and always keeps a certain kind of corn flour used in African bread. 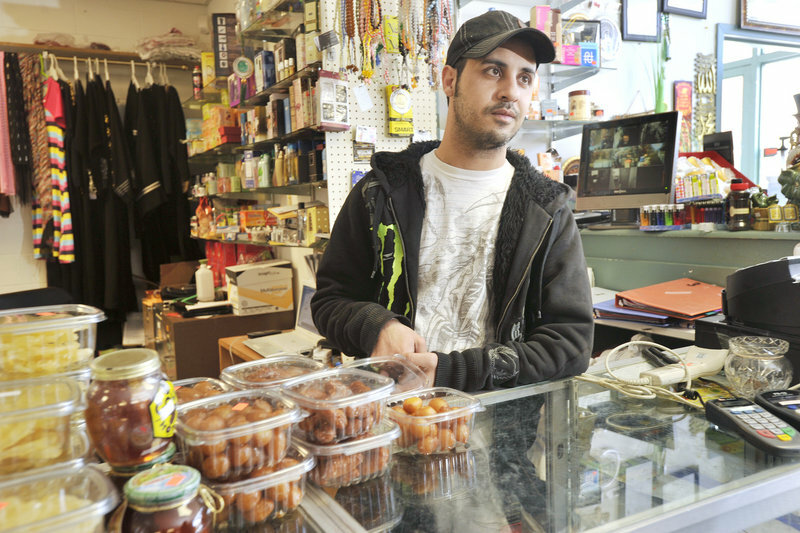 Jabbar Jabbar, whose brother owns the market, said he’ll take special orders for anyone. Working the register on a recent afternoon, he weighed a bag of goat meat for a customer while having a conversation in Arabic on his cell phone, held between his shoulder and his cheek. Behind the scale hung phone cards that he sells to people who want to place international calls, one kind for Africa and another for the Middle East. Those are the locations of the 11 countries of origin listed by last month’s applicants for general assistance from the city — a good indicator of who’s new in town. Program administrator Sarah Ludin said 33 of the 73 households that applied in February identified themselves as immigrants or refugees. That’s more than double the number of applicants from immigrants and refugees a year earlier, when they made up 16 of the 51 households. Down the hall from the general assistance office in the Westbrook Community Center, the food pantry has also seen an uptick in the number of immigrant families, said director Jeanne Rielly. Although they make up a relatively small percentage of people who come in — maybe three dozen of the 350 families, Rielly said — she’s gotten volunteers from Jordan and Rwanda to help with the growing number of clients who can’t speak English. In a different part of the building, English classes for adults on Monday and Wednesday afternoons are getting bigger every week. A young woman from Ethiopia dropped in halfway through the beginner class last Monday. She had been in America for two weeks. “Today, maybe just listen,” said teacher Mary Klement as she tugged on her own earlobes. Sitting in pairs at old science lab benches, the rest of the students repeated the words for types of jobs: receptionist, custodian, mechanic. They talked about their own jobs, too. A woman from Sudan said she had been a nurse. A couple from Angola had owned a travel agency. “We have folks that are walking in here with master’s degrees,” Klement said after class. For most, she said, their greatest motivation for learning English is to be employable in America. The beginner class is the biggest with 18 students — twice as many as there were in the fall semester, Klement said. At Westbrook Middle School, the English-language program also doubled in size within the school year, from 48 students to 99. In a classroom on the first floor, David Moisan’s math students look like any sixth- and seventh-graders, in hooded sweatshirts and skinny jeans. When they raise their hands, they wiggle their fingers, some with nails painted blue. But in addition to geometry, they’re also learning English. Along with words like scalene and congruent, they’re practicing how to say rectangle and square. Parallelogram proved particularly difficult as the class in unison read off the words from a white board on a recent morning. Of nine students in the class, three are from Africa and six are from Iraq. Some slipped into Arabic as they compared worksheets, waiting for Moisan to check their math. Over at Saccarappa Elementary School, one of Tiffany Oliver’s second-grade students was writing her name in Arabic on the white board. Written above it was the phonetic spelling of the word for good morning: Sa-ba-ha-clair. “They teach us stuff all the time,” Oliver said of her Arabic-speaking students. Saccarappa, which serves kindergartners through fourth-graders from the district that includes Westbrook Pointe, has the biggest English-language program of the three elementary schools. Principal Brian Mazjanis has a feeling the additional English-language teacher proposed in next year’s school budget will end up in his building. In addition to the 48 families who already live at Westbrook Pointe, many of those on the waiting list for apartments are Arabic-speaking, said Bob Sawyer, the property manager. At one point, he said, there were just as many Russian families living there, but most have moved on, some to buy houses of their own. Singer, from the Brookings Institution, questioned whether Westbrook is “just a temporary stop” for the immigrants who have relocated there in recent years. “They may be moving in and out as they can move up,” she said. That’s the hope of Amer Banijameel, whose family moved to Westbrook Pointe in 2010, after stints in Atlanta and on Allen Avenue in Portland. Compared to the apartment, his house in Iraq was a palace, he said. Now, his 12- and 14-year-old sons have to share a bedroom. But his kids are doing well in school and he doesn’t see a reason to move right now. “Maybe next month, maybe 10 years, maybe I spend all my life here. Who knows?” he said. If there was an opportunity to have a bigger house, he could see moving to another state. If the violence subsides in Iraq, he might want to go back home. The reason he would leave Westbrook would be the same as why he came. “When I get more choice, more chance, better life,” he said.